Classic Chrome: On this day, 24 May 1996 Views along the Rhein. On this day in 1996, my father and I made a circle trip along the Rhein from Köln to Koblenz, traveling south via the Right Bank and north via the Left Bank lines. Working with two cameras, I exposed these views on Kodachrome and Fujichrome slide film. Looking back, its amazing to see how much has changed on German railways in the last 22 years. 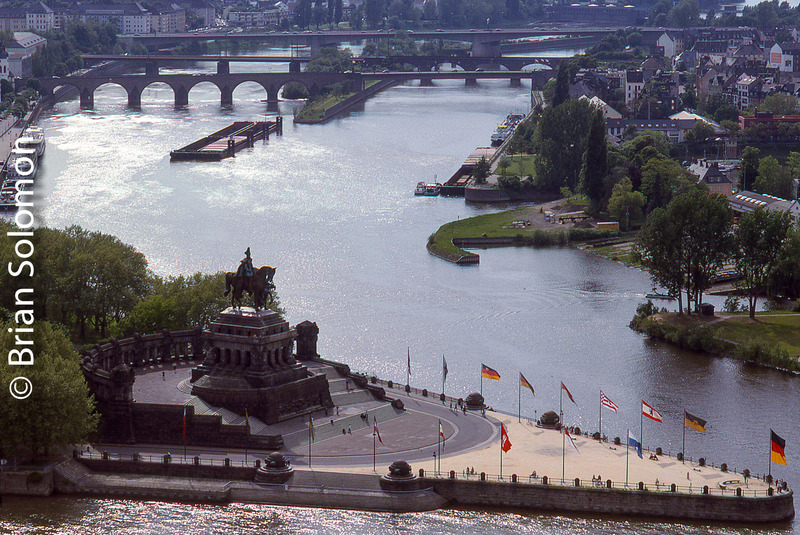 Confluence of Rhein and Mosel rivers at Koblenz. 24 May 1996. 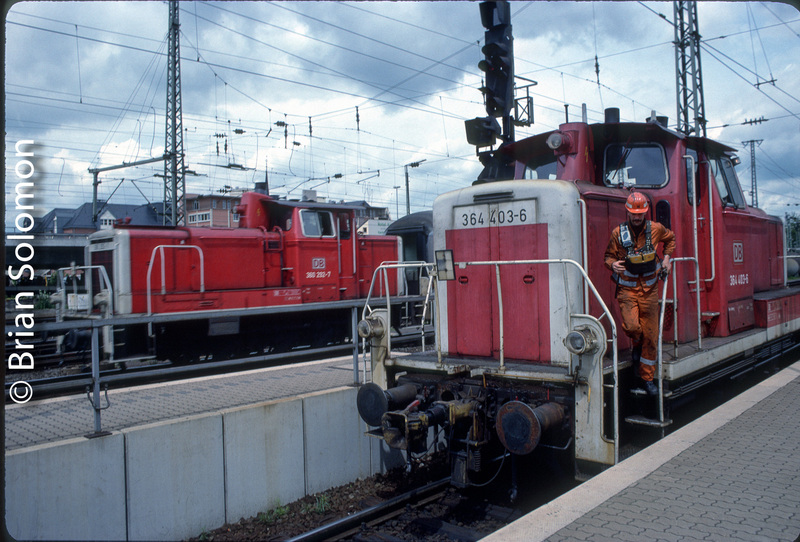 DB shunting locomotives at Koblenz Hbf on 24 May 1996. View of a northward freight on the Right Bank line along the Rhein from the walls of the Festung Ehrenbreitstein (fortress). 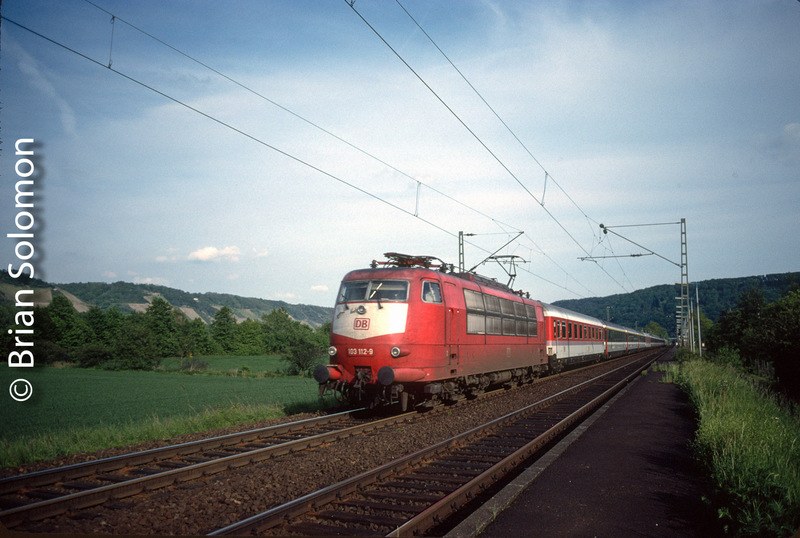 A northward IC train passes Namedy, Germany at speed behind a class 103 electric. Minutes later a northward EC (EuroCity) long distance train passes Namedy, this view with a 28mm lens. 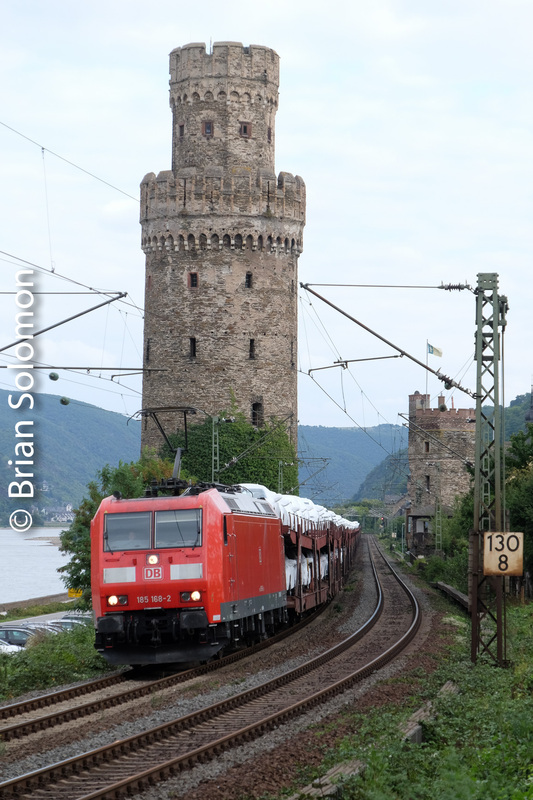 The scenic Mittelrhein are among the great railway trips profiled in my new book Brian Solomon’s Railway Guide to Europe, now available from Kalmbach Books/Kalmbach Hobby Store. 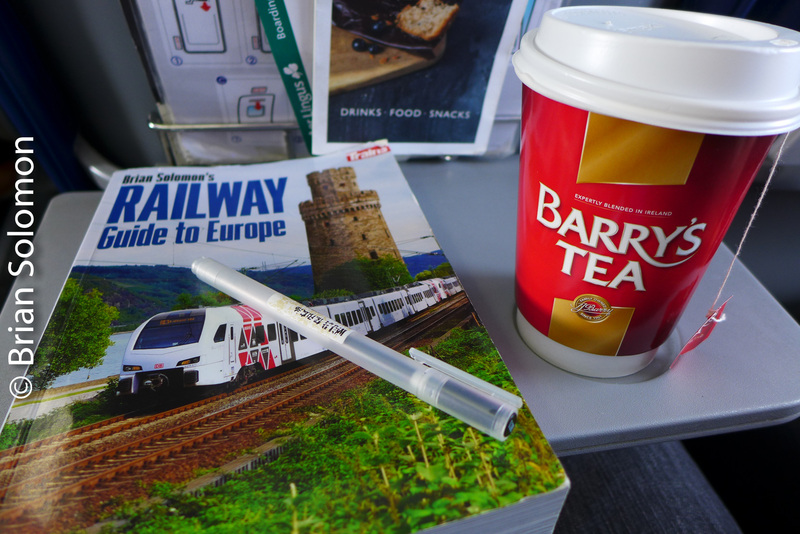 My new guide book on European Railway Travel with a cup of Barry’s Tea. Cover Considerations: Out-takes from my Railway Guide to Europe. The short answer is the image that the publisher hopes will best sell the product. When I was asked to supply potential cover images for Brian Solomon’s Railway Guide to Europe, I searched through hundreds of photos that I thought might work. I exposed the cover photo in Germany’s Rhein Valley using my FujiFilm XT1 with 18-135mm lens. My book should be available at the end of May. It is aimed at people looking to travel around Europe by train. I hoped for a cover image that showed a modern passenger train in a classic setting. Also, while the book covers a wide geographical span, I thought it would be best for the cover to focus on central Europe. 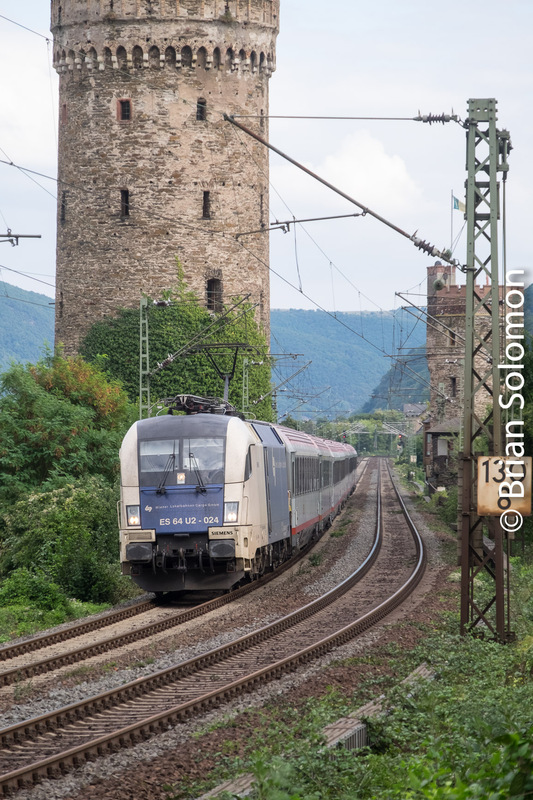 Kalmbach books narrowed my selection about 8 photos; while the choice was ultimately theirs, the image of a DB Regional Express passing a medieval tower at Oberwesel made my final cut. This photo was exposed in nice soft sunlight; it offers a pleasant scenic summer setting with a simple, yet striking composition showing a river, a castle and a decidedly modern European passenger train. The train’s paint scheme makes it easy to distinguished it from the surrounding landscape and it appears relatively high in the image area (if it appeared too low, it might not work well to sell the book). Also, there’s ample space for the book title and other writing. I made the cover image while on a visit to the Rhein valley with Gerry Conmy, Stephen Hirsch and Denis McCabe. 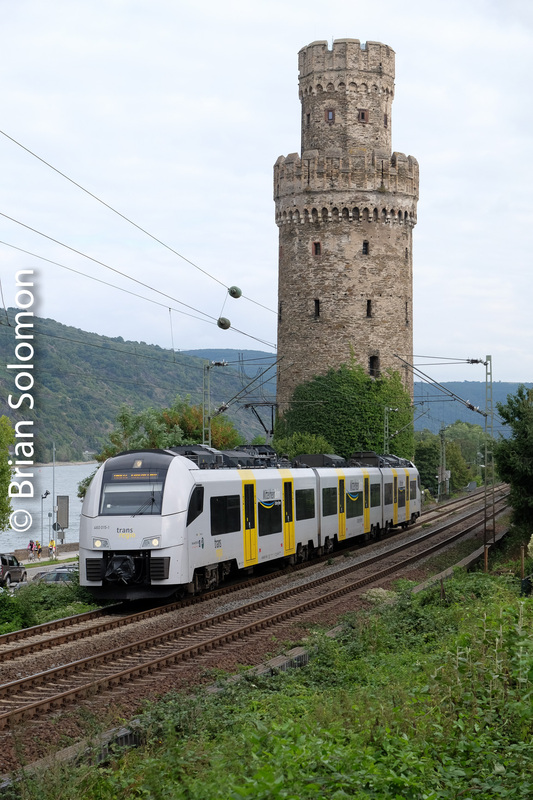 We spent the afternoon of 8 September 2015 photographing a parade of trains on the Rhein’s ‘left bank’ line. The cover image was selected from a burst of 4 photos. I’ve included a variety of the other photos I made during the same afternoon. This photo was made slightly later in the sequence of photos from which the cover image was selected. This Mittelrheinbahn local train was exposed a few minutes after the cover image. The lighting isn’t as nice as the cover image. 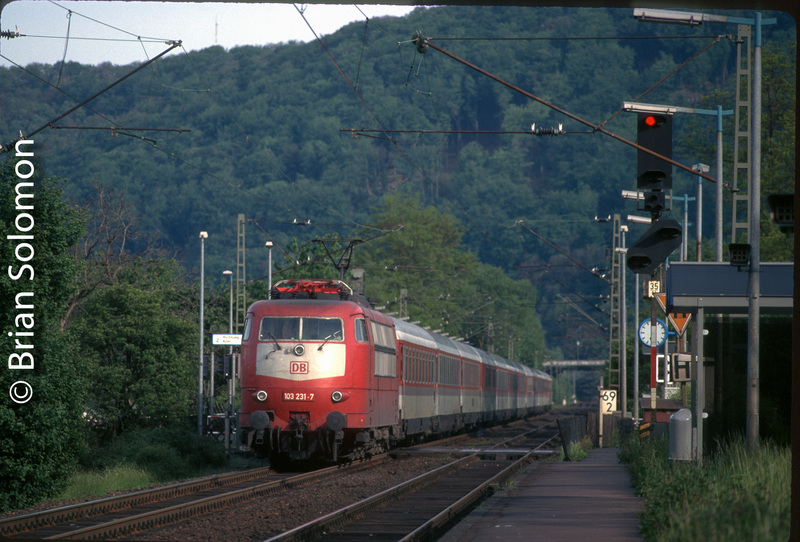 A DB class 101 electric leads an IC train at Oberwesel. Although a dramatic image, the train is lower in the image area, the catenary masts present greater visual clutter and the train is a generation older, thus will tend to date the book more quickly. DB auto train. Admittedly, while I like the views of freight trains, these are are unlikely to sell the book to passenger train riders. I did include a handful of freight photos inside the book. Including a vintage image my father made on an SNCF freight in 1960. 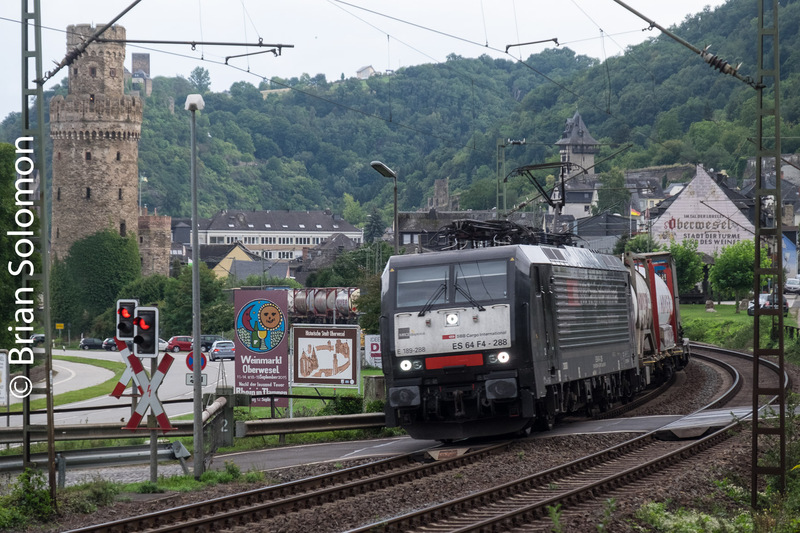 A Swiss Cargo intermodal freight at Oberwesel. This was one of many freights that I photographed that afternoon. 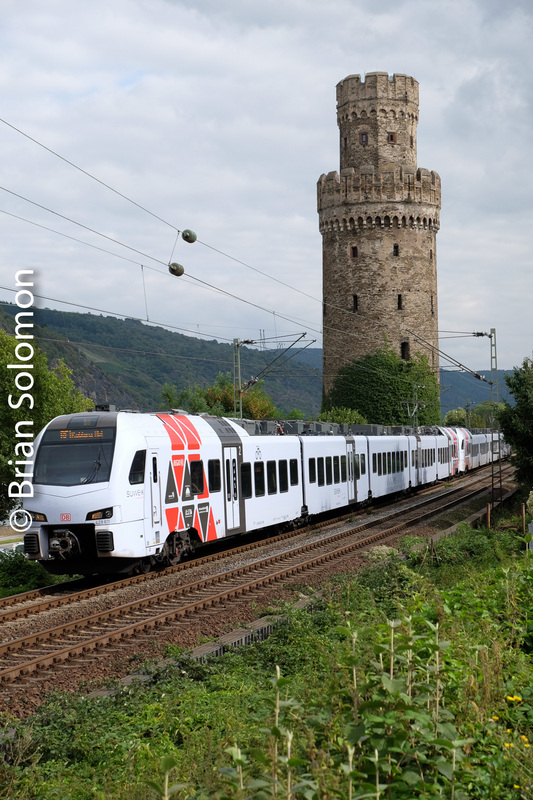 An Austrian EC train with leased Taurus electric and ÖBB carriages, makes for a nice international image. The colors of the locomotive don’t work as well as the DB Regional Express ultimately selected. Crossrail is one of many private operators running freight on German rails. A DB class 101 leads an EC train with SBB carriages. Now who left his camera bag in the photo? Catching this vintage class 225 ‘Rabbit’ with a maintenance train was a real coup. Yet, hardly cover material for a book aimed at riding trains. Here’s a slightly different angle at the same location. This features a castle perched atop the hill, but is a more cluttered view. All of these images were exposed over the course of less than an hour using my FujiFilm X-T1 digital camera. 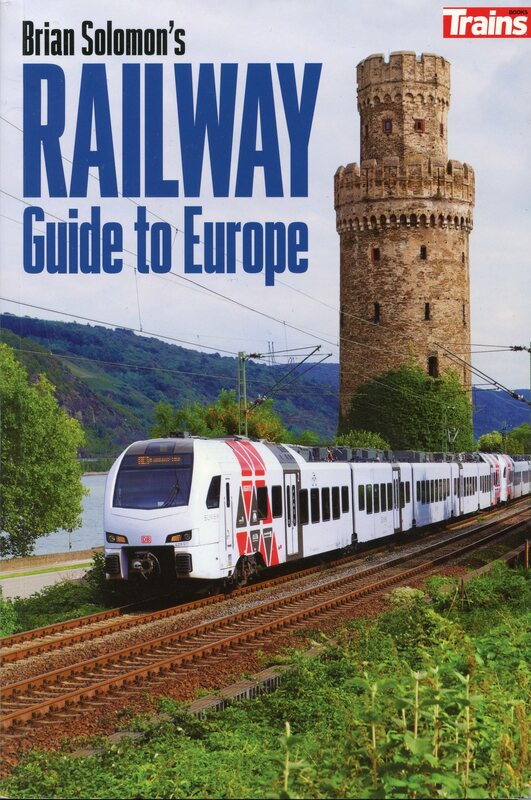 Brian Solomon’s Railway Guide to Europe should be available at the end of May. 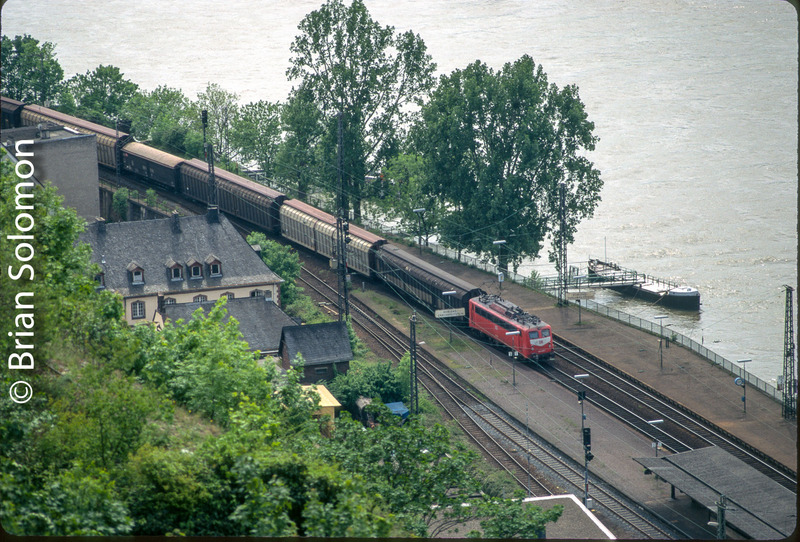 German Class 140 in Classic Livery near the Loreley Rock. In early September, my friends and I witnessed the passage of this old German class 140 electric in classic green paint. Every day in late morning or early afternoon it would work south along the Rhein’s Right Bank (east side) with a freight. On this day we hiked out to the Loreley statue on a peninsula near the famous Loreley Rock at bend in the river. I made these photos with my FujiFilm X-T1. As the freight drew closer, I opted to pan, which helps set apart the green locomotive from the hillside beyond. By panning, I’ve improved the visual separation between the locomotive and the background. MittlerheinBahn operates modern Siemens-built electric multiple units on all-stops local trains on the picturesque Left Bank route between Köln and Mainz, Germany. Trains operate on an hourly basis throughout the day, with more frequent services at peak times. The service is affordable, comfortable and the scenery provides an unending tapestry of wonder. These trains come at such regular intervals, it would be easy enough to let their passage go undocumented while waiting for more unusual movements, such as freights with colourful engines. But I always try to make the most of all trains. Over the course of a week I exposed dozens of images of MittlerheinBahn’s trains, often using them as a catalyst for complex scenic compositions. Would these views work if there were no trains in them? Köln Hbf. FujiFilm X-T1 photo. Take a spin! These trains offer a smooth ride at a reasonable price. Large windows provide a great view of the scenery. Lumix LX7 photo. A view from a vineyard near Boppard. FujiFilm X-T1 photo. Two ways to see the Rhein; by train and by ship. A view south of Boppard. FujiFilm X-T1 photo. At Oberwesel, where castle towers and walls make for a Medieval setting. FujiFilm X-T1 photo. Climb a tower for a better view. (Really I was waiting for a freight, but we’ll get to that in a later post.) FujiFilm X-T1 photo. A wink of sun north of Bingen. Would this be a more interesting image if the train were closer, but bathed in shadow? I have no doubt that punchy delicious colours and heavily altered contrast can grab the attention of viewers. I saw Fantasia, I look at Facebook. It’s not a matter of right or wrong, or right or left. With modern software, tweaking colour and contrast has never been easier. Below are three versions of an image I exposed digitally in the Rhein Valley. Not necessarily in order: One image is RAW (straight out of the camera, only reduced in size for internet), the other two have been altered. Of these latter two images, one is my interpretation of how the scene appeared at the time I exposed the photo, the other is pure fantasy. I’m calling this version Image A. This one is Image B.
I’ll let you sort out which is which. Of the three, which do you like the most? There’re some locations that just jump out at you. This view of the Rhein’s Right Bank is one of them. The combination of the river with vineyards rising above punctuated by the ruins of a medieval castle make for a postcard view. The railway is an added bonus. Red Die Bahn locomotives are a nice touch. It helps to have bright afternoon sun. Flirt at Kaub, Germany. Exposed with a FujiFilm X-T1 digital camera from platform level using the positionable rear display. Right Bank passenger services are largely provided by Rhein-Main-Verkehrsverbahn. Trains are operated by VIAS Gmbh as Stadt-Expresses use Stadler Flirt electric multiple units and make local stops between the Koblenz Hbf (on the Left Bank) and the Frankfurt area. 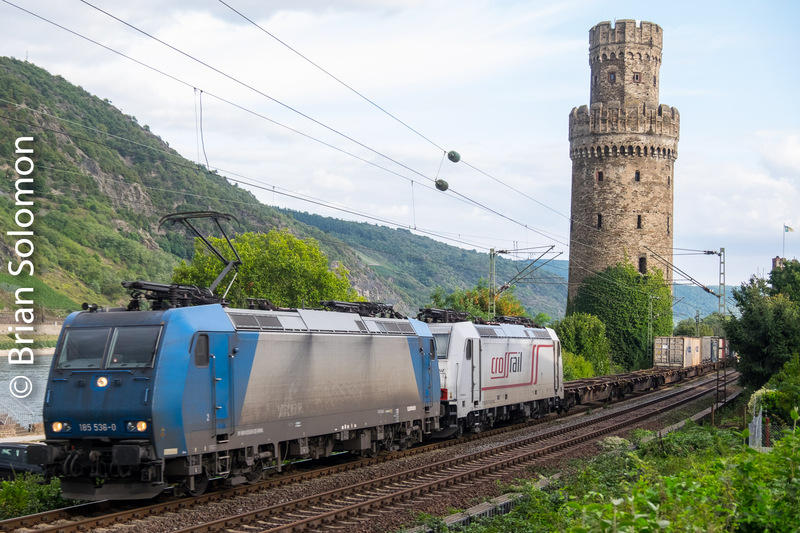 Every hour all day long (with half hourly intervals at peak times) these modern Flirts glide along the supremely scenic Rhein Valley, working between the seemingly continuous parade of freights on the same line. The cars stand out nicely against lush back drops and make for interesting photographic subjects. The tricky part is selecting the correct exposure to avoid over-exposing the lightly coloured trains. A northward Flirt approaches Filsen. This early morning service catches the glint of the rising sun. Mist in the air makes for added atmosphere, but complicates the exposure. Here I’ve opted to set the exposure manually to retain highlight-detail on the side of the train. FujiFilm X-T1 photo. A grab shot of a Flirt exposed with my Lumix south of the famous Loreley Rocks. I was focused on the tug boat when this Flirt emerged from the tunnel at Oberwesel. FujiFilm X-T1 photo. Another angle from Oberwesel, this view from the top of an old stone tower that was part of the city walls. FujiFilm X-T1 photo. View from the Right Bank opposite Oberwesel. Lumix LX7 photo. Flirt near Bingen. Exposed with my Lumix LX7. Glinty Flirt reflects in the Rhein near Kaub. FujiFilm X-T1 photo. Yesterday (September 10, 2015) was an exceptionally clear and bright day in the Rhein Valley. The conditions were ideal for photographing across the river, which opened up numerous photo locations. Gerry Conmy, Dennis McCabe, Stephen Hirsch and I selected this view near St. Goarhausen. Behind us is the double track west bank (or ‘Left Bank’) line. In addition to DB (Deutsche Bahn—Germany Railways), there a great variety of private and open access operators on the Rhein Valley lines. I used my Lumix LX7 to capture a southward freight led by a Siemens Taurus electric against an impressive cliff-face as intermodal ships pass in the river. There’s always something interesting to watch alone the Rhein. This was just one of dozens of trains we photographed yesterday. Southward freight near St. Goarhausen, Germany, September 10, 2015. 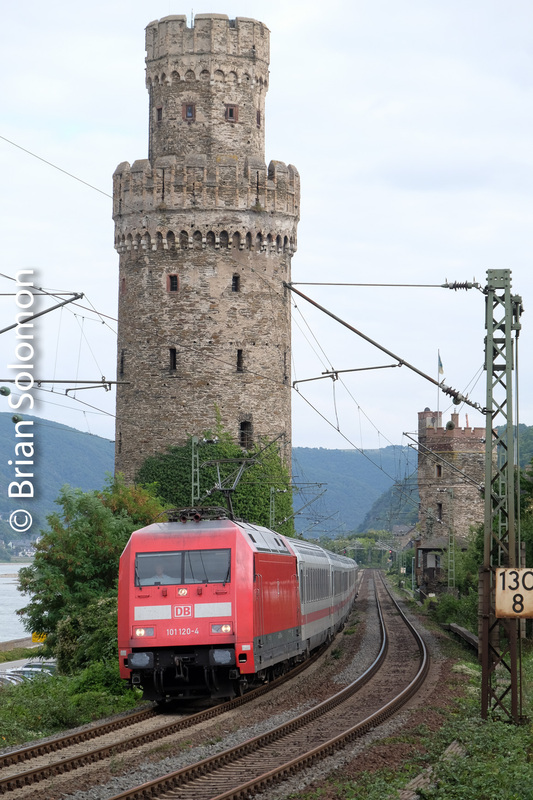 Germany’s Rhein valley is one of my favorite places to photograph railways. Here dual double track lines operate on either side of the river, and wind among stunning scenery, with castles and medieval architecture. The variety of trains makes it even better. I never know what to expect next. How about a a yellow rabbit in work train service? Exposed with a Fujifilm X-T1 mirrorless camera. File modified in post processing to control contrast and adjust exposure. Note the Right Bank line on the far side of the Rhein. The six track railway bridge over the Rhein at Koln offers a continuous parade of trains. In just a few minutes I made many interesting photos. In this image, on of DB’s Class 120 electrics whirrs over the massive bridge. This electric was among the earliest commercially-built locomotives using a modern three-phase traction system. It was among the more unusual trains I photographed on the evening of September 2, 2015. April 9, 2010; a group of my Irish friends and I were on a week long trip to the Rhein and Mosel Valleys. The Rhein is great place to experiment with equipment and technique. Busy double track mainlines occupy both sides of the river amid stunning scenery and historic architecture. I was set up at the south end of the station platform at Kaub on the Right Bank. This is the busier freight line, with trains passing in fleets. Rarely ten minutes would pass without something clattering along. My vantage point also gave me a good view of the Left Bank and the Pfalzgrafenstein—a colorful castle situated on an island in the middle of the river. Working with my Lumix LX3, I played with the camera’s aspect ratios as an exercise in composition. A DB class 151 electric leads a southward container train at Kaub, Germany. I’ve used the Lumix LX3 with the 1:1 (square) aspect ratio to frame the train with the castle on the side of the hill and lighting masts on the left. April 9, 2010. I made this image of a northward car train from the same location as the above photo. By selecting the Lumix’s 16:9 aspect ratio I had a panoramic frame with which to compose my photo. My intent was a juxtaposition of the castle in the river with the freight train. Would this photo work if the DB locomotive wasn’t bright red? Along the Rhein at Festung Ehrenbreitstein, May 1996. Exposed on Fujichrome Provia with a Nikormat FTN and Nikoor f1.8 105mm lens. Ehrenbreitstein-Koblenz station on May 24, 1996. I made this view from the massive fortress above the Rhein opposite Koblenz. My father and I had traveled by train from Köln. The train pictured was a local train gliding in for a station stop. Trains are plentiful on this line, and every few minutes freights would rumble along the river. To view the river and railway from the massive stone walls is an experience. We arrived by cable car, and departed by a Mercedes Taxi. What a cool place! Tomorrow: Freight in Marin County! The Left Bank at Oberwesel—September 2013. Oberwesel is south of Boppard and also on an elbow-bend in the river. It’s spectacularly set along the river and against steeply rising hills while featuring castles and a medieval city wall. 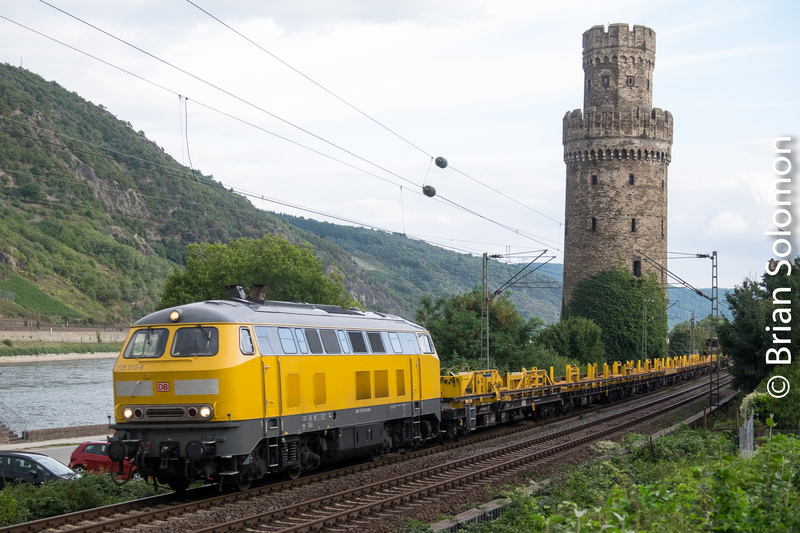 A DB class 120 glides southward through Oberwesel in September 2013. Canon EOS 7D photo. The old city wall is set up as a tourist attraction and can be easily used as a platform for photography. Not only does this provide great views of the line on the Left Bank, but gives superb angles of the dual tunnels on the line serving the Right Bank. I visited Oberwesel in April 2010, but the light was a bit dull, so I’ve been aching for another try at it on a clear day. While there are some good angles in the morning, I found the best light angles were obtained after about 2 pm. September is a great time to photograph because the light is good throughout the day and it’s past the peak tourist season. Jostling elbows with the masses while trying to focus on a IC train might be challenging. A diesel running as a light engine northbound made for an ideal opportunity to frame a train in the window of a medieval wall tower. Canon EOS 7D photo. The parade of trains is unceasing. If one side of the river starts to lag, the other will seem to make up the difference. It was only during the lunch that traffic seemed to lull. Certainly the passenger trains kept coming, but the freights must of all paused for a snack. A few hours at Oberwesel gave me more great images than I knew what to do with. I could make this a multi-installment post. Will you still be there for Oberwesel Left Bank Northward Views Part 12? Hmm? A DB Class 101 leads an InterCity passenger train southbound. This view is from the top of an old wall tower at Oberwesel, Germany. Canon EOS 7D. The Oberwesel city walls give good views of the line on the far side of the Rhein in the afternoon. 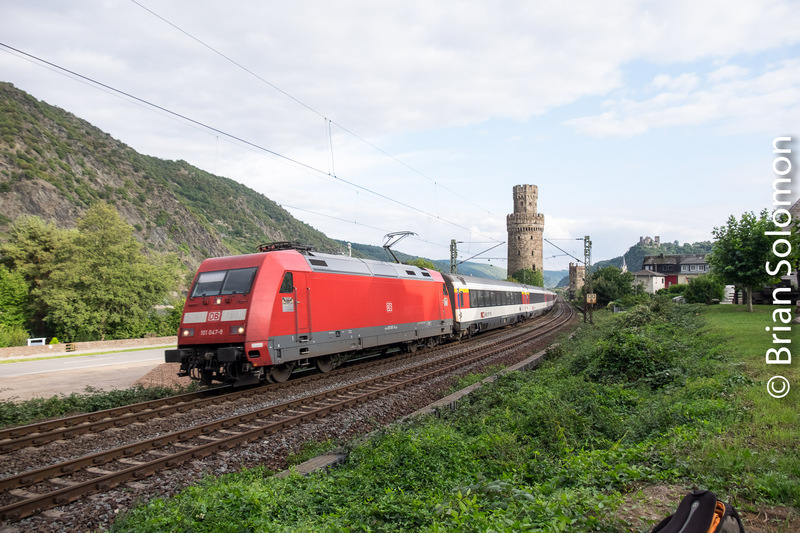 A Swiss BLS locomotive is about to disappear into the tunnels opposite Oberwesel. Canon EOS 7D photo. 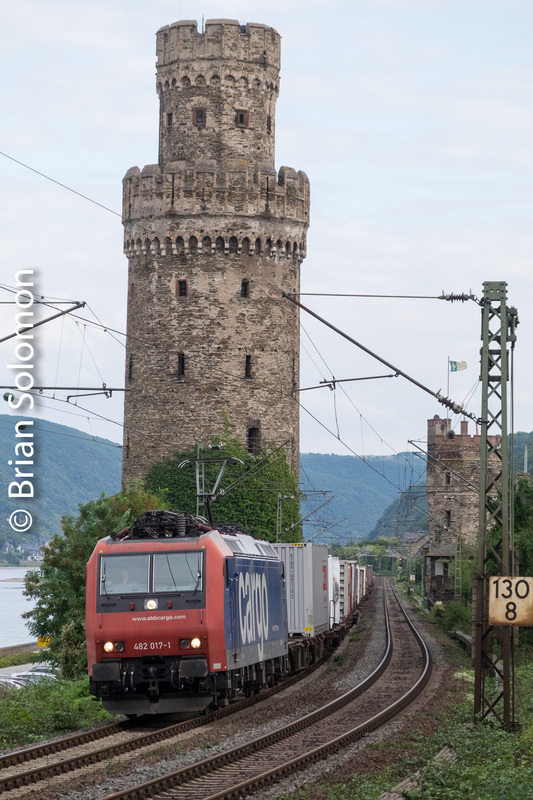 An ERS Railways Class 189 hums along with a southward container train along the Rhein’s ‘right bank.’ Canon EOS 7D photo. Rich afternoon light graces a Taurus electric leading a northward InterCity train at Oberwesel. This view was made from the city wall. Canon EOS 7D photo.